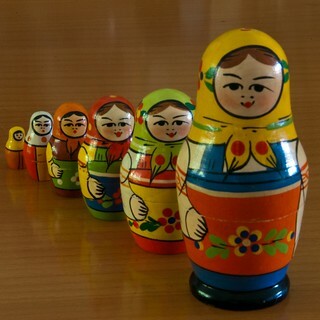 These dolls came into our family when I went on a trip to Moscow with my school back in 1979. I got them as a gift for my mother, and she kept them as a cherished possession until she passed away earlier this year, at which time they found their way back to me. They have been well played with throughout their 30 year history with our family. © All rights reserved. John Krzesinski, 2009.